My mother-in-law is a pomegranate juicing expert. I watch her every day lovingly peeling, seeding and juicing pomegranates for an hour for her husband. She goes through so many pomegranates that the two trees on the property don't produce enough fruit for her. You may wonder why she doesn't just buy commercially prepared pomegranate juice, but once you try it at home you'll know the difference. The commercial varieties (even those with 100% juice) are prepared from concentrate, which definitely affects the flavor. My mother-in-law is actually so fanatical about the flavor of the pomegranates that she takes a knife to the grocery store, buys one, and makes sure it is sweet before buying a lot more. She first started juicing the seeds with a juice extractor, but found that this wasted a lot of juice, so she has come up with a tried-and-true method for extracting every last drop. Read on to learn her tips. She could merely gather 1/2 cup of juice out of 5 pomegranates in the juicer waste bin; the pomegranate seeds would still be very moist. She now uses a blender to juice the pomegranates, seeds and all. She then strains the juice from the pulverized seeds, and then uses a double layered cheese cloth to extract every last drop of juice. All you need is 5 large ripe pomegranates to get about two and a half cups. First, wear dark-colored clothes. Pomegranates stain! Trim the crown using a sharp paring knife. Gently cut the outside skin around the fruit without touching the seeds, creating 6 wedges around the fruit. Gently open the fruit with your thumbs and scoop the seeds out (without bruising them) onto a deep large platter. Remove and discard the white membrane. In a blender, gather the seeds of the 5 pomegranates, 1/2 cup of ice cubes and 1/3 cup of water for a smooth flow. Blend until very smooth. Strain the liquid through a medium-mesh strainer. Collect the pomegranate pulp in a double-layered cheese cloth and drain as much liquid as possible (use food service disposable gloves). Strain the pomegranate juice one more time through a fine-mesh sieve. Use the pomegranate seed remnants for the soil of your garden. You'll get 2-1/2 cups of fresh pomegranate juice. 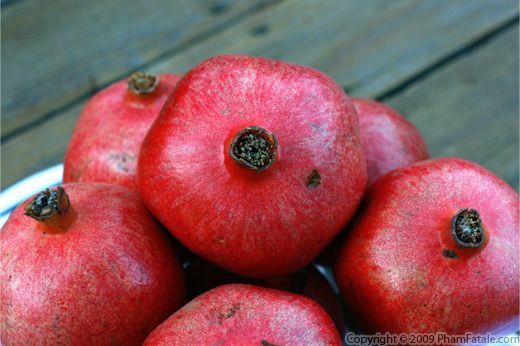 No need for additional sweetener if you picked ripe pomegranates. Out of desperation (and lack of a juicer), I extracted pomegranate juice in this exact same way a while back. It did work wonders, and it is especially important to remove all of the white membranes or it will be bitter. For low mess, score the pom skin in the shape of a cross, centered on the blossom end. You only have to score about halfway down, to the 'equator'. Now (here's the big tip), dunk it in a sink or bowl of lukewarm water. Tear it apart with your fingers, and extract seeds underwater. All the waste will float, and can be easily skimmed off. No stains, either! Thanks for the tip Kathy! Hi Jackie! I'm finally back. I agree, fresh pomagranate juice is a world away from the bottled stuff. The way I extract seeds is to cut the pom in half and then tap the back of it over a bowl with a dowel. The seeds fly right out, but the kitchen can look like a mass murder occurred. I'll have to try the submerged in water trick that Kathy listed. What a great post! I never knew how to make pomegranate juice. Your mom-in-law must really love her husband! Thanks for the tip :) I recently discovered pomagranates and next time I buy some I'll try to make some juice. I must say your mom in law is an expert. Yes, I know I lost a lot of value juices while juicing pomegranates but didn't know how to yield more until I read your post. Great tips. Thank you for sharing. I just got 2 cups of juice from 2 pomegranates using my new angle juicer! score in half, pull apart. the smack the back side with a wooden spoon and the seeds just fall out. did a whole fruit from start to finish in under two minutes! You will get 15% discount if you contact us on the website's contact form and mention phamfatale.com as a referrer.